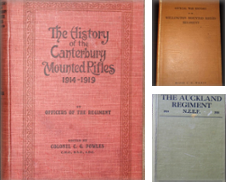 Specialists in New Zealand military history books, particularly first edition official histories of the Great War and World War Two. We also stock troopship magazines and various publications by the men themselves as well as some Allied official histories. We welcome your enquiries and will search for books at no obligation to you. Please visit our website to learn more about these books and the men they honour. To find books that cover periods other than the World Wars, please click on the "Browse our Catalogs" button below or enter the name of the conflict - for example"Maori" for the Maori Wars - in the "keywords" field. via ABE, we never know or handle your card details. Orders usually ship within 2 business days. Shipping costs are based on books weighing 2.2 LB, or 1 KG. If your book order is heavy or oversized, we may contact you to let you know extra shipping is required. Express international courier options available on request. Within New Zealand, we prefer and advise Courier post for more valuable items.